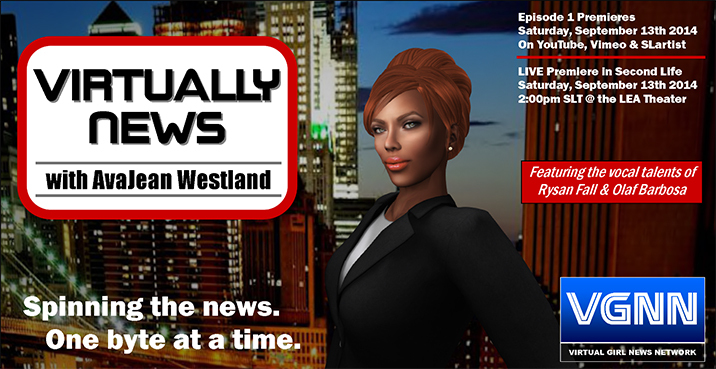 You are cordially invited to the premiere of the comedy machinima “Virtually News with AvaJean Westland” this Saturday, September 13th 2014 at 2:00pm SLT at the Linden Endowment for the Arts (LEA) sim. Creator AvaJean Westland will be on hand with actors and crew (scheduling permitted) from the film to talk about the making of the piece and to answer questions. Dress is upscale casual to formal – whichever you choose. Please keep scripts and prim counts low, and please arrive a little early to get your seat and for textures to rez. We will be showing the film in-world as well as provide links for YouTube, Vimeo and SLartist. So if you can’t make the premiere in-world, let me know and I’ll send you the links when the film is live. This film is for mature audiences only; please ensure no very young children are watching! Virtually News with AvaJean Westland” is a mock/spoof news piece machinima created by actress/writer Gameela Wright. Filmed exclusively in Second Life, in the vein of SNL’s “Weekend Update” and “The Onion News Network,” AvaJean’s irreverent take on current events and pop culture pushes the boundaries while using animation as the filter. As her Second Life alter ego AvaJean Westland, she performs live theater with the Avatar Repertory Theater Company (ART). She has worked as a voice actor or avatar puppeteer for The Blackened Mirror, Running Lady Productions, Chantal Harvey, Island Rain Studios, and Alfonso Kohn. In addition, she created machinima for the Project Homeless campaign (“The Quiet Dark Wind”) and SciFi Film Festival (“Centuries Past”) in conjunction with Screen My Shorts and The University of Western Australia (UWA). “Centuries Past” took home two awards. It is her hope to use machinima as a way to bridge real and second life and to help cement machinima as a form of animation that appeals to all. Next Post: Designing Worlds at the Relay for Life Weekend – now on the web! Pingback: Virtually News with AvaJean Westland – Premiere today at 2pm (Post-94069) - [O.L.D.] Old London Docks - Best Second Life Fashion & Lifestyle Blog Feeds!